Understanding how to use Catalina coupons can be a real money saver. The following list of questions and answers will help anyone new to Catalina couponing get started. Catalina coupons are full-color, long paper coupons that print out from small printers located near the registers in the checkout areas at grocery and drug stores. The coupons are triggered to print when a cashier scans a UPC code from a qualifying product that a shopper is buying. A manufacturer coupon for money off a specific product. A money-back store coupon for a dollar amount off of the next purchase. A coupon for a local business or venue. An announcement about a current or future product or in-store promotion. Why Do Couponers Love Catalina Coupons? Catalina coupons are valued by couponers because they can be paired up with other types of coupons, which help shoppers save a lot of money. They can also be used to reduce the price on products that usually are not promoted with coupons, like fresh meat and produce. Catalina coupons offering money off on specific products are classified as manufacturer coupons and (depending on the store's policy) can often be redeemed along with any store coupons for the identical items. It is referred to as stacking coupons. Say Albertsons gave me a Catalina coupon two weeks ago for $5 off of 10 cans of Alpo Prime Cuts. This week, the store is advertising a store coupon for 25 cents off Alpo Prime Cuts priced at 75 cents a can. My friends always give me dog food coupons, and I have been able to collect 10 of the Alpo store coupons. After purchasing 10 cans of Alpo and redeeming the 10 Alpo store coupons and the Catalina coupon, I received 10 cans of Alpo dog food for free! Alpo Prime Cuts, 75 cents per can or $7.50 for 10 cans. 10 store coupons for 25 cents off per can = minus $2.50 for 10 cans. Catalina coupon for $5 off 10 cans = minus $5 for 10 cans. Total of 10 cans of Alpo is $7.50 (minus $2.50, minus $5) = Zero!! Say that Target has a Catalina promotion for $15 off your next purchase if you buy $40 worth of Procter and Gamble (P&G) products. There is also a Target promotion for a $3 Target Gift Card when you purchase any Swiffer floor cleaner. Target's coupon policy allows shoppers to combine a manufacturer coupon (paper or Cartwheel digital), a Target coupon (mobile or paper), and a Cartwheel offer on an item. You have several P&G coupons that you printed from the P&G website. You also printed Target store coupons that matched up with your manufacturer coupons. Step Two: The cashier rings you up and the subtotal= $40 before using any coupons. Note: The total must be $40 before any coupons or tax is applied to qualify for the Catalina. Purchase Total is $24, plus the $15 Catalina coupon and the $3 Target Gift Card. The total value after the Catalina coupon and Target Gift Card is applied is $6 for $40 in products! Catalina dollar-off coupons always state that the coupon can be used on your next purchase. To decrease the amount of cash that you spend during the same trip to the grocery store, you can "roll" a Catalina coupon by separating your purchase into two transactions. The first transaction will be the items that will qualify for the Catalina coupon, minus any manufacturer or store coupons. The second transaction will be the remainder of the items, minus any manufacturer or store coupons. You will then use the Catalina coupon that you received from the first transaction to pay for the second transaction. Remember, the coupon says "next purchase," not next day or next week. Target gift cards work the same way. Example: Using the P&G and Target example above, let's say you not only had the P&G cleaning products to buy, but you also wanted to buy hamburger meat, buns, chips, and soda. To lower your out-of-pocket expense, you decide that you want to use the $15 Catalina towards your purchase and the $3 Target gift card. You also notice that if you buy two 12-packs of soda, you will qualify for a $4 Target gift card. Step One: Have the cashier ring up the sale like it is shown in the above example (qualifying P&G items, minus the manufacturer coupons, then minus the store coupons) and total it. You will pay $24 out of pocket. You will then receive the Catalina coupon for $15 off your purchase and the Target gift card for $3. 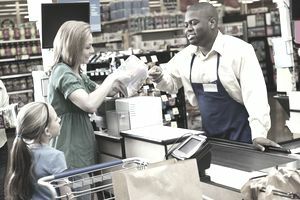 Have the cashier ring up the second transaction with your remaining items. The second purchase comes to $18. Give the cashier the Catalina coupon for $15 and the $3 gift card. Your out-of-pocket expense will be zero for the second transaction, plus you will receive a $4 Target gift card to use the next time that you shop. Your total out-of-pocket expense for the P&G products and the additional items (hamburger, buns, chips, soda) will be $24. The total after the $4 Target Gift Card is $20. Had you not had any manufacturer or store coupons, the Catalina coupon or Target Gift Cards. then your out-of-pocket expense would be $58. Catalina coupons can be store-specific or a manufacturer coupon that can be used in other stores. Make certain to read the terms that are on each Catalina coupon that you receive. Also, check your store policies about Catalina coupons. Some stores will accept store-specific Catalinas distributed at a competitor's store. Many Catalina coupons that you will receive will relate to products that you have purchased. For example, if you bought Gravy Train dog food, it might trigger a Catalina coupon for savings on Alpo dog food as a way to entice you to try the different brand. Finding out which Catalina coupons are available before you shop can be challenging, but not impossible. Some grocery stores (Albertsons in my area, for example) will post sale cards by the applicable products, that explain the trigger (Buy Two, Get a Coupon for $3). The weekly grocery store circulars might also use wording like, "X-amount off your next purchase" which is another way of saying that the product qualifies for a Catalina coupon. Also, an online search of "current Catalina coupons" will direct you to the websites that have running lists of Catalina coupons that shoppers have received. However, the information may or may not apply to your area since Catalina coupons are distributed regionally. A lot of this information may seem overwhelming if you are the new to couponing, but start small and stick to it and within a few shopping trips you will be able to come up with your own shopping scenarios that will save you a lot of money.